Much is written about Egypt’s Omar Assar, his performances lifting the north African country to new heights; it would appear he has a worthy successor, a young man to follow in his footsteps and perhaps in the next few years raise the bar event higher. 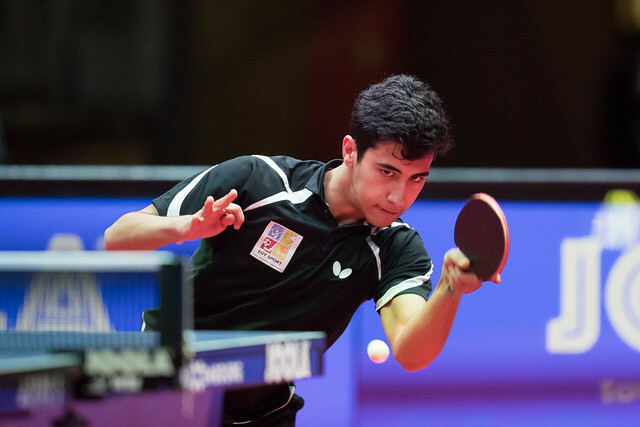 Stand tall, Youssef Abdel-Aziz, at the Luxembourg 2018 ITTF World Junior Circuit Finals, above all, he has been the player to attract the attention. In his very first match of the tournament he caused a major upset by beating Kanak Jha of the United States, the top seed (5-11, 13-11, 11-3, 7-11, 6-11, 11-6, 11-7). Now as the second day of action, Saturday 3rd February, came to a close, once again he raised the eyebrows. Occupying the no.10 seeded position, he accounted for Cristian Pletea, the no.2 seed (11-9, 7-11, 14-12, 11-7, 11-6) on what was not the best of days for Romania. Additional to Cristian Pletea, Rares Sipos, the no.4 seed was beaten by India’s Manav Vikash Thakkar, the no.3 seed (11-8, 11-9, 11-8, 5-11, 11-8); the young man who currently occupies top spot on the Under 18 Boys’ World Rankings. An earlier than anticipated meeting between the third and fourth seeds; the reason being that Rares Sipos had experienced defeat at the hands of Russia’s Denis Ivonin in the group phase of proceedings (11-7, 11-7, 3-11, 11-9, 11-6) and thus had to settle for second place. Denis Ivonin remained unbeaten to top the group and duly maintained his fine form; the no.6 seed. He accounted for Chinese Taipei’s Feng Yi-Hsin, the no.5 seed in a tense seven games encounter determined by the minimal two point margin in the decider (16-14, 11-5, 5-11, 7-11, 14-12, 14-12, 11-9) to reserve his place in the last four. At the semi-final stage he meets Kanak Jha, the quarter-final victor over India’s Manush Utpalbhai Shah, the no.9 seed (11-8.11-8, 11-9, 13-11); in the opposite half of the draw Youssef Abdel-Aziz faces Manav Vikash Thakkar. Play in Luxembourg concludes on Sunday 4th February.